Dia de los Muertos Art Workshops | FREE & all ages! Every Saturday in October at Self Help Graphics & Art! It's our favorite time of year again for sweater weather, calabacita everything, Dia de los Muertos altar building and programming!!! Now in our 45th Anniversary year, SHG proudly brings a series of DIY workshops for the whole family, where people of all ages and levels can learn to create Dia de los Muertos paper flowers, papel picado, decorate calaca masks and learn the techniques in creating papier-mâché calacas. All supplies will be provided. Note: Parents, please accompany your children to the workshops. We kindly ask that children not be left unsupervised. Thank you for your cooperation. Help us kick off our Día de los Muertos season our with our 45th Annual Commemorative Print unveiling and exhibition opening, How We Remember and How We Survive, on Thursday, October 4th from 7-10 pm at SHG. The exhibition is curated by SHG Artist-In-Residence and our 45th Annual Commemorative Print Artist, Dewey Tafoya. 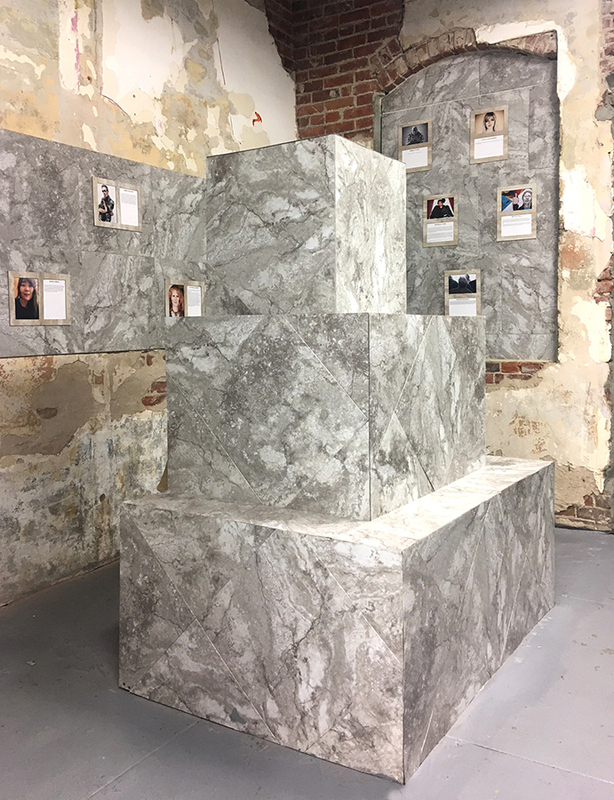 Participating artists will explore life happenings that make us who we are in joy or trauma, thus how we remember these situations and how we survive them, as expressed through one-of-a-kind art. Featured artists include Amitis Motevalli, Jennifer Gutierrez-Morgan, Jose Sotelo, Nery Gabriel Lemus, Dalila Paola-Mendez, Michael Alvarez, Nani Chacon, Zeke Pena, Noni Olabisi, Cruz Ortiz, Miyo Stevens-Gandara, and Ofelia Esparza. FREE and family friendly. 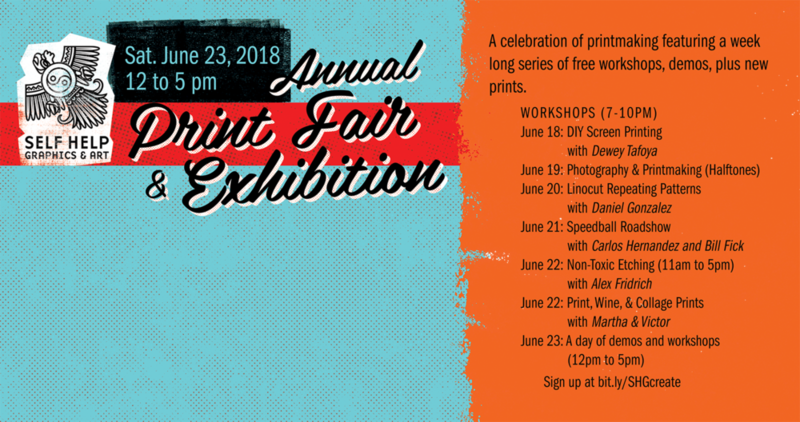 This panel will explore the process through which artists who specialize in different mediums experiment and learn screen-printing techniques in order to most effectively translate their primary art forms into screen-prints. 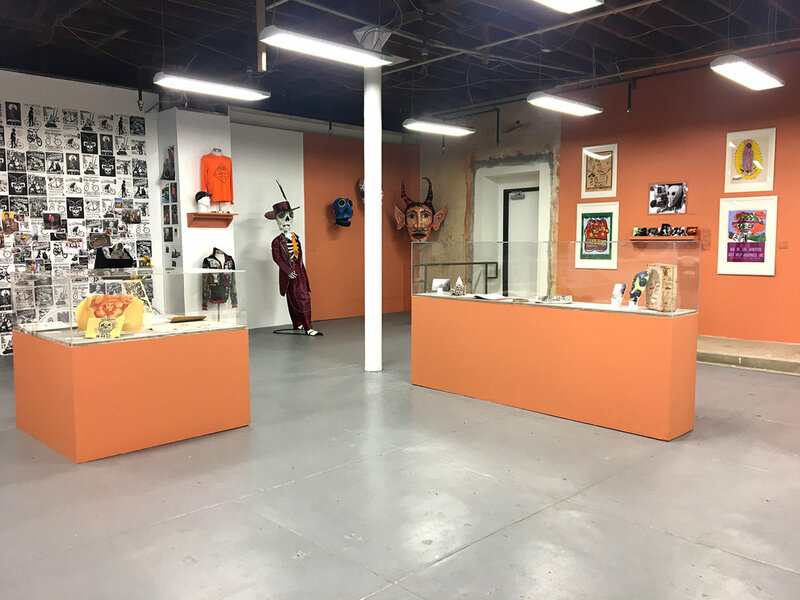 Entre Tinta y Lucha celebrates the 45th anniversary of the East Los Angeles cultural and community art organization, Self Help Graphics & Art (SHG). The exhibition looks back at over four decades of the organization’s artistic innovation and excellence, organizational resilience and expanded activity, by featuring a display of over fifty fine art prints from throughout the organization’s history. Inspired by the Chicano Movement of the late 1960s and the rise of printmaking as a legitimate art form during the same period, SHG was founded by Franciscan nun, Sister Karen Boccalero, and local Chicano artists Carlos Bueno, Antonio Ibañez, and Frank Hernandez in East Los Angeles. Since its incorporation in 1973, SHG has produced over 1,000 art print editions, including 54 Atelier projects and exhibitions all over the world. 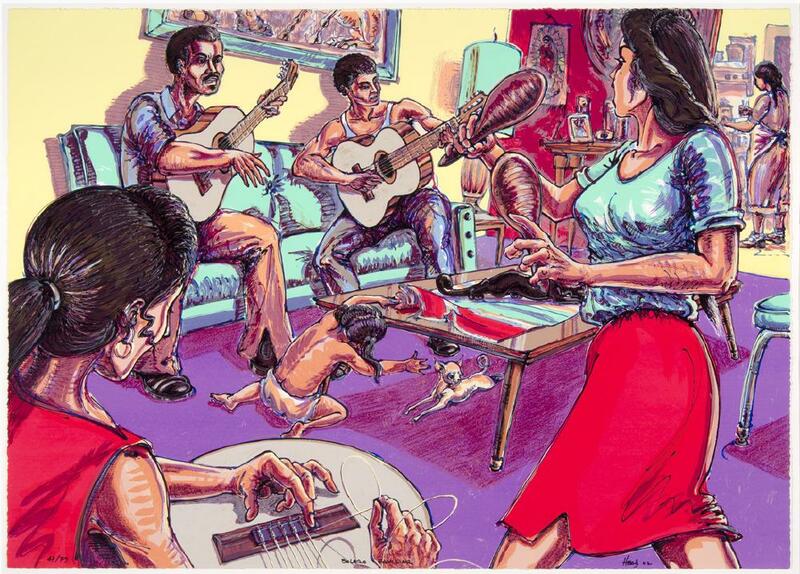 The organization remains dedicated to the production, interpretation and distribution of prints and other art media by Chicana/o and Latinx artists; and its multidisciplinary, intergenerational programs promote artistic excellence and empower community by providing access to working space, tools, training and beyond. The exhibition also looks forward to an exciting evolution of Chicana/o and Latinx aesthetics. 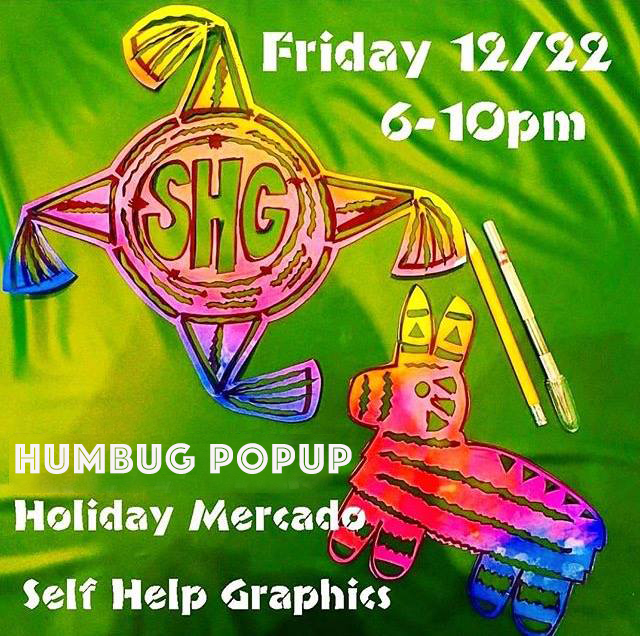 Undeniably, Self Help Graphics & Art has continued to represent the heart of the Chicano Art Movement in Los Angeles. Before major art institutions began exploring community engagement in the arts, SHG understood the power of art to affect change in our communities and that this shared experience defined how people from diverse backgrounds related to each other through their creative practices. 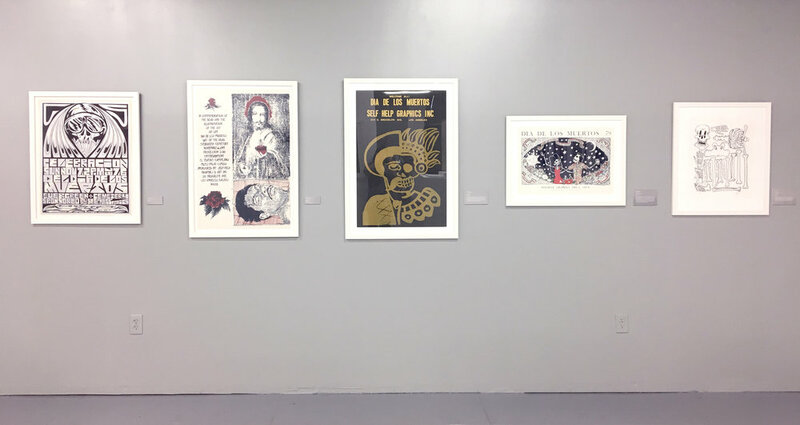 Now, nearly a half century later, SHG continues to foster emerging Chicana/o and Latinx artists through its world-class printmaking studio and supports the role of artists as leaders, both within its organization and the community. A series of artist-led panels from the perspective of SHG’s print studio (see programming), will accompany the exhibition to get perspective from the artists themselves about the history and value of the organization to the community and the greater Los Angeles art world. Entre Tinta y Lucha marks a historic collaboration between Self Help Graphics & Art and Cal State LA-- two community institutions with roots in the Eastside of Los Angeles. The exhibition, panel discussions and workshop will be hosted at Cal State LA’s Fine Arts Gallery and is curated by university faculty members Michelle Lopez, MA/MFA and Victor Hugo Viesca, PhD., in partnership with Self Help Graphics & Art. The exhibition is FREE and open to Cal State LA students and the public beginning August 21, 2018- September 29, 2018. 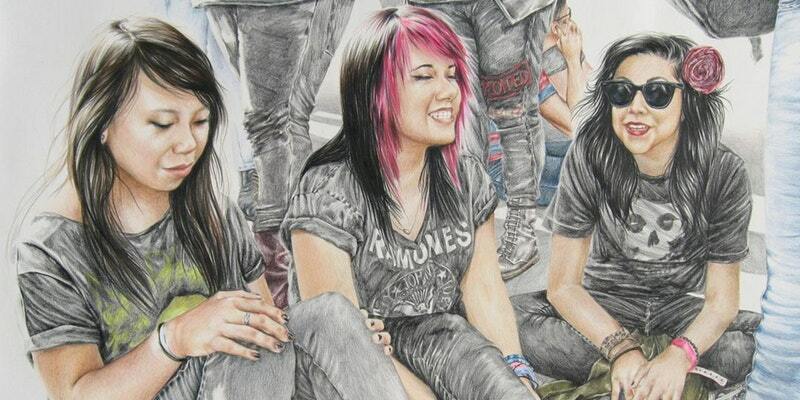 The Fine Arts Gallery is located at Cal State LA's main campus and is open Monday-Friday, 12pm-5pm. The gallery will be open extended hours, 6pm-9pm, during exhibition programming on the following Thursdays: September 6th, September 13, and September 27. Entre Tinta y Lucha: 45 Years of Self Help Graphics & Art celebrates the 45th anniversary of our East Los Angeles cultural and community art organization. The exhibition looks back at over four decades of the organization’s artistic innovation and excellence, organizational resilience and expanded activity, by featuring a display of over fifty fine art prints from throughout the organization’s history. The exhibition also looks forward to an exciting evolution of Chicana/o and Latinx aesthetics. Entre Tinta y Lucha marks a historic collaboration between Self Help Graphics & Art and Cal State LA. The exhibition is FREE and open to Cal State LA students and the public beginning August 21, 2018- September 29, 2018. The Fine Arts Gallery is located at Cal State LA's main campus and is open Monday-Friday, 12pm-5pm. The gallery will be open extended hours, 6pm-9pm, during exhibition programming on the following Thursdays: September 6th, September 13, and September 27. Entre Tinta y Lucha will include panel discussions at 6 and 7:30pm on September 6th, September 13, and September 27 to further explore artist perspectives, their experiences as part of SHG's Professional Printmaking Program and how the organization impacted their professional trajectory. Additionally, the series touches on topics such as the technical side of printmaking, social justice, historical contributions, gender, and identity. The exhibition, panel discussions and SHG's Barrio Mobile Art Studio workshop will be hosted at Cal State L.A.'s Fine Arts Gallery. Join us for the closing day of Self Help Graphics' Getty Pacific Standard Time LA/LA exhibition, Día de los Muertos: A Cultural Legacy, Past, Present, and Future. Tours during the day will be led by our team of Youth Ambassadors. February 10th @ 1:00pm Tour with Leo Limon during the Mercadito de Amor pop up shop from 12:00-5:00pm. Tours are free. If you are interested in attending, we kindly ask that you please RSVP via Eventbrite by clicking HERE. January 6th @ 1:30PM with Altar Artists Ofelia Esparza, Gerardo "Acamonchi"
Following the tour on January 6th from 2:15 - 4:15 pm, Marcus Kuiland-Nazario will be hosting "Crafternoon". Artist Marcus Kuiland-Nazario bring his itinerant craft table to SHG immediately following the tour. Make your own crown in honor of Three Kings Day with family and friends. All materials provided and activity is family friendly. Grab a hand-made unique gift from one of our local artists or artisans. Panel Discussion: Día de los Muertos - Cultural Appreciation or Appropriation? 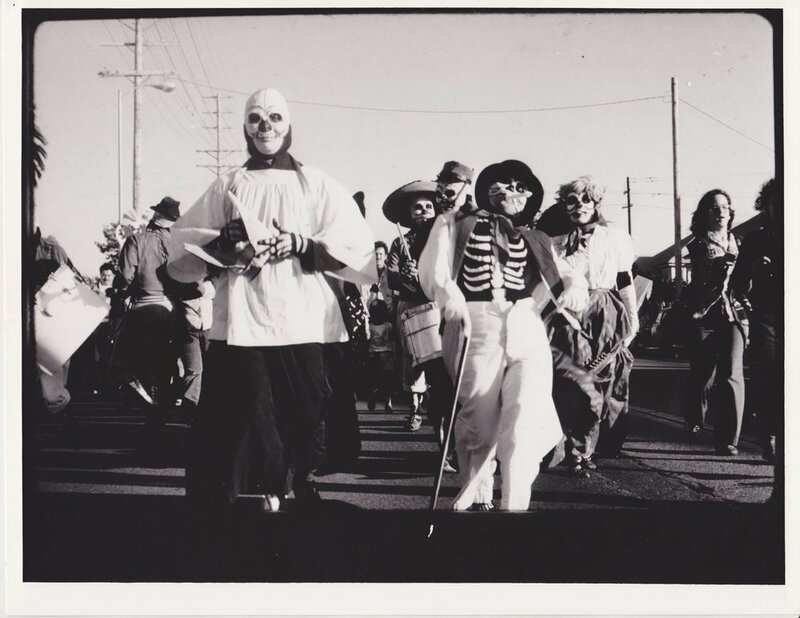 Join Marietta Bernstorff, Consuelo Flores, and Lalo Alcaraz for a panel discussion around how Día de los Muertos' popularity has exploded in the last decade in the United States and globally. The celebration has become ubiquitous in Los Angeles and across the country is a mix of traditions of remembrance, pop culture and commercialization. Self Help Graphics & Art's Day of the Dead celebration has been from its origin about innovation and the formation of a tradition that is rooted in the Chicano identity, not an exact replica of the Mexican tradition. In what ways has this evolution shaped the celebration north of the border and how is it influencing change in Mexican celebrations? Is this growth and popularization a positive appreciation of culture and what is the line between participation and appropriation? This panel is presented as part of programming around Self Help Graphics' PST LA/LA exhibition, Día de los Muertos: A Cultural Legacy, Past, Present and Future, on view until February 24, 2018. Beginning at 6pm, prior to the panel, will be a guided tour of the exhibition. Marietta Bernstorff is a contributor to Self Help Graphics' catalog of Día de los Muertos: A Cultural Legacy, Past, Present and Future with her essay titled "Processes of Appropriation and the Transformation of Tradition in Day of the Dead Festivities" and has more than 30 years of experience in the arts, in both México and the United States. Bernstorff has been an artist, curator, teacher and director of numerous non profits and collectives in Arizona, California and Oaxaca. Currently she is curating a traveling exhibition for the Museum of Contemporary Art in Oaxaca (MACO) and is teaching at the international art workshops (Cultural Bridges) in Oaxaca 2017 - 2018. Consuelo Flores is a multidisciplinary artist from East Los Angeles. She has an MFA in Creative Nonfiction from Antioch University and is a member of Fierce Backbone Theater Company in Hollywood. She has written and directed three one-act plays at the Frida Kahlo Theater 10-Minute Play Festival in 2014 - 2016. As a poet, she's presented and performed her work throughout the US and Mexico. She is also known for her work for the Day of the Dead which includes literary altars, cultural tours, lectures on the traditional and contemporary history as well as detailed altars, and Day of the Dead fashions. Lalo Alcaraz is a nationally syndicated editorial cartoonist of the daily comic strip "La Cucaracha", host of the Pocho Hour of Power radio show on LA's KPFK 90.7 FM, teaches illustration and comics, and is the author of books including "Migra Mouse" and "Latino USA: A Cartoon History". Most recently he has served as a writer and producer on "Bordertown" and as a cultural consultant to Pixar's "Coco". Tickets are FREE, but RSVP is kindly requested via Eventbrite.